I have recently finished one great book and one great article on Accountable Talk and Classroom Discussions. Stein, M. K., Engle, R., Smith, M. & Hughes, E, Orchestrating productive mathematical discussion: Five practices for helping teachers move beyond show and tell. Mathematical Thinking and Learning, 10, 313-340. Chapin, Suzanne, O’Connor, Catherine, & Anderson, Nancy. 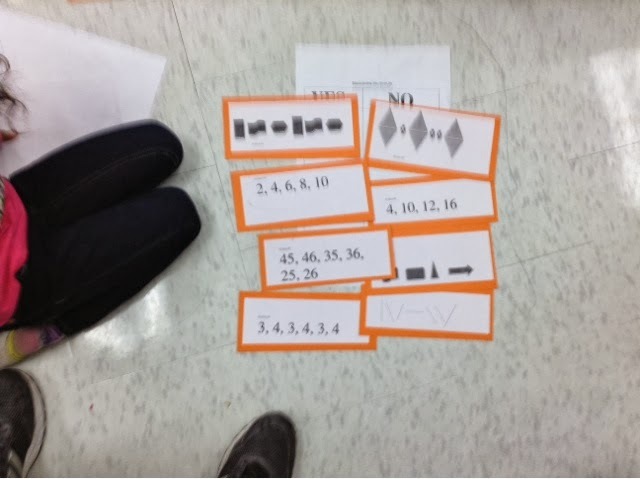 Classroom Discussions: Using math talk to help students learn. California: Scholastics. 2009. Accountable talk is one of my passions as I have spent the last four year studying the impact it has on my classroom. I highly reccomend these two readings for anyone interested in learning more about accountable talk. However, I also know that in teaching we really don’t have time to sit down and read. For this reason I thought I would summarize them for you and include them in my blog (I appologize in advance as this will create a rather long post). These ideas come from the two resources above and my own thesis work. I hope they are practical advice for anyone in their teaching practice. · neither student or teacher will participate in bad environment. Everyone needs to feel comfortable. o This sends the message that the teacher wants to understand the students’ thinking. o As students talk record what they are saying without comment. When they are done ask them , is this what you meant? § Why do you think that? § What convinced you that was the answer? § Why did you think that strategy would work? § Where in the text is their support for that claim? § What is your evidence? § What makes you think that? § How did you get that answer? § Can you prove that to us? o Not only are these excellent talk moves but excellent questions that push students beyond their thinking and make excellent mathematical connections. · Do you agree or disagree…and why? § Why do you agree or disagree? · Who can add on? o When you ask this question make sure that you wait for answers as this may need time to develop connections. Five Practises suggested by Stein, M. K., Engle, R., Smith, M. & Hughes, E.
§ You also don’t want to ignore the ones who talk all the time. You can talk to them and let them know that you are not ignoring them but are just trying to allow others to participate. Should I call on students who do not raise their hands? v there is research to suggest that students will learn by listening but you will also hinder the class progress in discussion. To help try creating a positive space that allows all students to feel comfortable and willing to participate. Huh?” How do I respond to incomprehensible contributions? v The temptation is to simply say, “Oh, I see. How interesting….” and quickly move on to another student. v Try Revoicing or repeating what they have said. After you have done this ask them is this what you meant? v Record their strategy on the board and ask them is this what you meant? Brilliant, but did anyone understand? What should I do when students are wrong? This discussion is not going anywhere or Students’ answers are so superficial! § As you are walking around and looking at work, look for the progression your students are taking. This will lead you to a group discussions. What questions are the students asking themselves? What problems are occurring? What big ideas are they trying to work out, have worked out or are struggling with? § As teachers we are comfortable asking questions but do our questions already have responses? Are we leading the kids to OUR thinking or our we allowing the students talk to LEADthe thinking. Yes you are very much in control of the discuss and have to lead but it is not YOUR thinking but THEIRS that should be articulated. 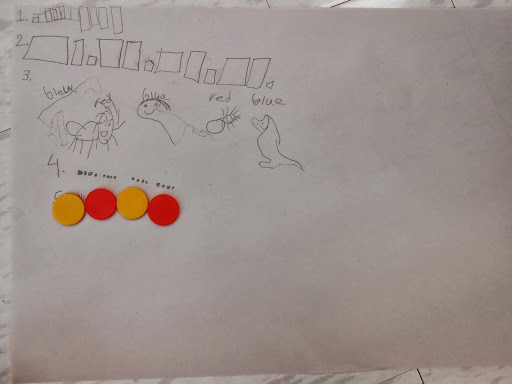 Today was our first formal lesson in patterning. 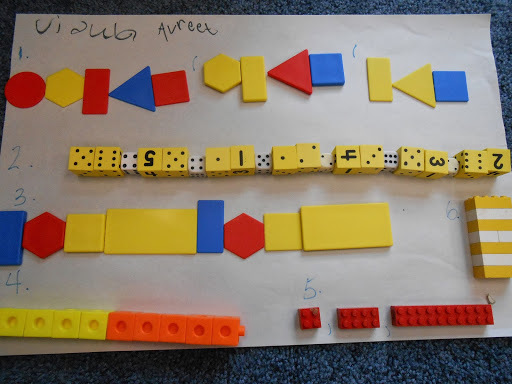 What I mean by that is we have been discussing patterns but more in the context of number sense, where we have been learning to count by twos, fives and tens, as well as, doubling numbers. 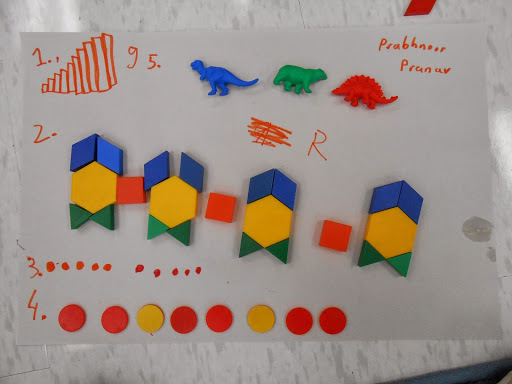 This type of talk has been focused on the magnitude of numbers and associated with place value not so much on growing and shrinking of patterns. 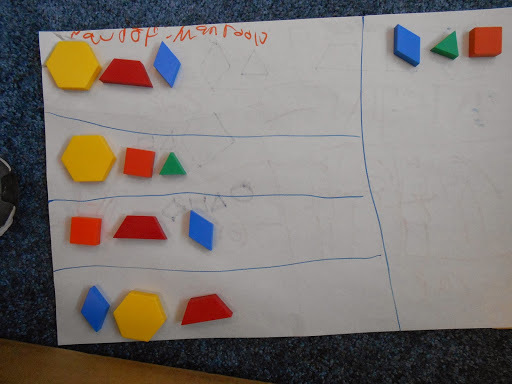 So today we started with a problem that was asking the students to sort eight sets of (patterns and none-patterns) into two categories, a yes it is a pattern and a no it is not a pattern. I have attached the patterns down below. It was very interesting conversation around this. 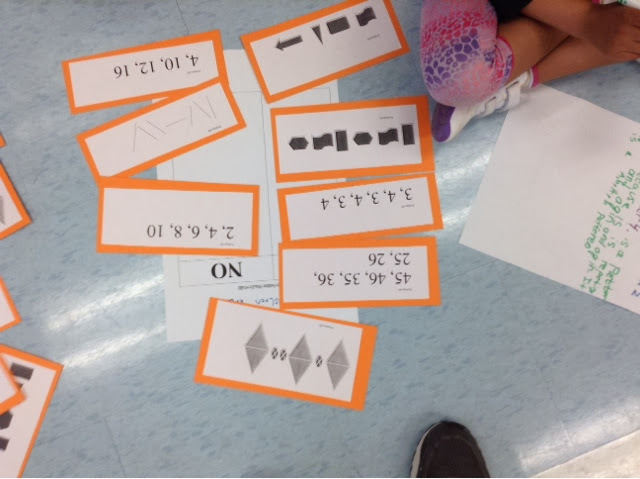 At first the students put only the repeating patterns in the yes category stating that for it tone a pattern then it had to repeat. I had to remind them about the book we read called patterns big and small. In this book they had a set of nesting dolls, I’m asked the kids did that pattern repeat? After that discussion the kids where better off explaining their reasons for their groupings. 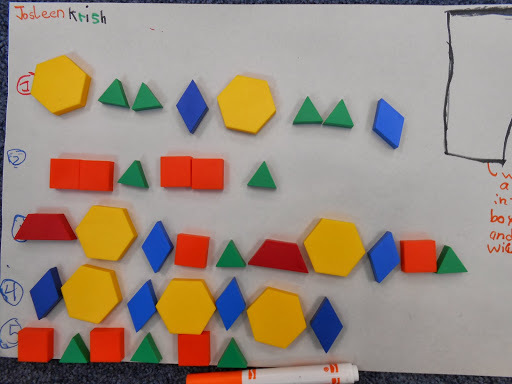 I really liked this question because it made the students really think about what a pattern is and what attributes are needed to make a pattern. 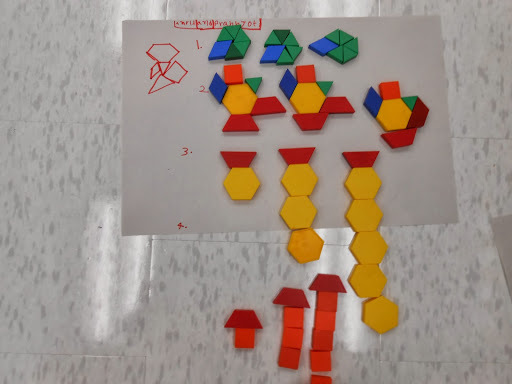 They obviously had worked with patterns in grade one but mainly with repeating patterns, which is why they at first they only made piles with repeating numbers. 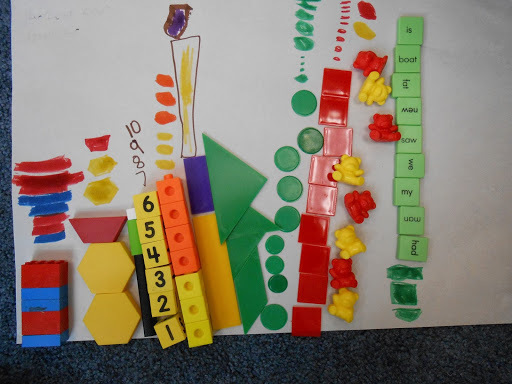 The non-patterns are also helpful because they can assist us with thinking about what attributes a pattern doesn’t have and therefore in the end has. Today we are going to be working on the justifying of their answers and then coming up with a definition of what a pattern is and is not. If your grade two or any grade for that matter I highly recommend this type of problem for your class.